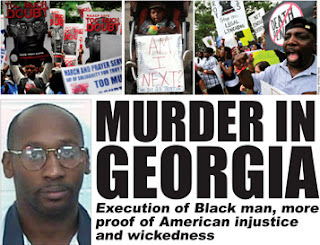 (FinalCall.com) - The title of its state song, “Georgia on My Mind,” could be a fitting symbol of what is dominating the outrage of people across United States and many the world over with the execution of Troy Davis. “We're hurting and we thank everyone for everything they did. Like my brother said this struggle didn't start with him and it shouldn't end with him. We can't stop. His death was not in vain. He told us he wants us to keep fighting to prove his innocence and that's what we're going to do,” Martina Correia, his elder sister, told The Final Call in a phone interview on Sept. 22. “We must abolish the death penalty. It's time for the old South to change and its time for us to pressure these apathetic Black officials who keep allowing injustices like this to keep happen. This movement isn't over,” said Ms. Correia. On September 21, at 11:08 p.m. Eastern Standard Time, Mr. Davis was pronounced dead—some say murdered—by lethal injection in Jackson, Georgia. Ms. Correia said she and her family spent at least six hours visiting with her brother the morning of the execution. “We did not witness the execution,” she said. “It sounds awful, but it's kind of a relief that it's over for me. There is no reason to celebrate or do anything because this is sad for both families. I'm sure his family has suffered terribly too,” Anneliese MacPhail, the mother of the deceased officer Mark MacPhail, told reporters following the execution. According to U.S. media representatives who witnessed the execution, Mr. Davis used his last words to continue declaring his innocence. “I am innocent. The incident that happened that night was not my fault. “I personally did not have a gun. I was not the one who took the life of your father, son, brother,” said Mr. Davis while strapped to the gurney and needles being injected into his arm. “Every life is precious with Allah, the life of the policeman that was killed and the life of Troy Davis,” said the Honorable Minister Louis Farrakhan of the Nation of Islam, in a statement released hours before the execution took place. “The arrogance of authority to not fiercely fight for the truth that may exonerate him is dangerous for the state of Georgia. When Cain slew his brother Abel, God told him that the blood of your brother cries out from the ground for justice. If our brother is killed, and he is innocent, I feel sad for the state of Georgia for the God of Justice will retaliate,” warned Min. Farrakhan.